1. Buffy the Vampire Slayer (and Joss Whedon)—I first discovered the show in eighth grade and it blew my mind. It showed me what storytelling could be and made me seriously want to write. 2. Harry Potter books—Buffy may have made me a writer, but in fifth grade, it was Harry Potter that made me a reader and showed me what books could be. 3. TV in general—Buffy opened the floodgates of TV for me. I love getting to know a group of characters, following them over time, and getting invested in their stories. 4. Winter—The colder, and wetter the better. I’m also in love with cold dreary weather. Even if I have to be out in it. 5. Lion Cubs—The Philly Zoo had lion cubs a couple of years ago and I became obsessed! I mean, come on, look at them! 6. Philly Sports—Baseball and hockey are my favorites, but I kind of love them all. 7. Disney—I love Frozen. And Peter Pan. And the whole Disney World experience. When I sold Crossing the Line I went to Disney World with my family for my birthday. 8. Gummy Bears—I don’t have a huge sweet tooth, but when I get a bag of gummy bears, I tend to eat them all in one sitting and then complain I have a gummy tummy. (This is also why I rarely buy gummy bears). 9. Cheesy fries and Mac & Cheese—These are my food weaknesses. I have an entire Pinterest board dedicated to Mac and Cheese recipes. 10. Yoga and Running—I never thought I would be a person who lists forms of exercise as one of her favorite things, but it turns out I am. I like yoga because it calms my mind down and I like running because it lets my mind run wild. So, you know, balance! * Sorry about the odd cropping. Meghan Rogers has been telling stories since she could talk and writing creatively since she was first introduced to the concept in third grade. She spent her high school years completing her first novel and has been actively writing ever since. 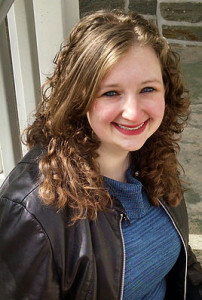 After college, Meghan went on to work with high school writers while earning her MFA in Creative Writing from Rosemont College. She is currently living in the Philadelphia area and working on the next Raven Files novel. And that’s all for my stop on the blog tour!